As each office periodically cleans through its product library for information and material samples that are no longer needed, there is a great opportunity to reduce landfill waste and make donations to organizations that would happily reuse them. In Charlotte, more than 400 architectural binders were recently donated to an organization named Classroom Central, which in turn distributes them to students in need. A wide range of material samples was also donated to an art teacher working for Union County Public Schools. Suzanne McDade and Kerry Petrie were instrumental in researching and connecting with the right organizations for each, along with transporting the material samples in Suzanne’s hatchback. 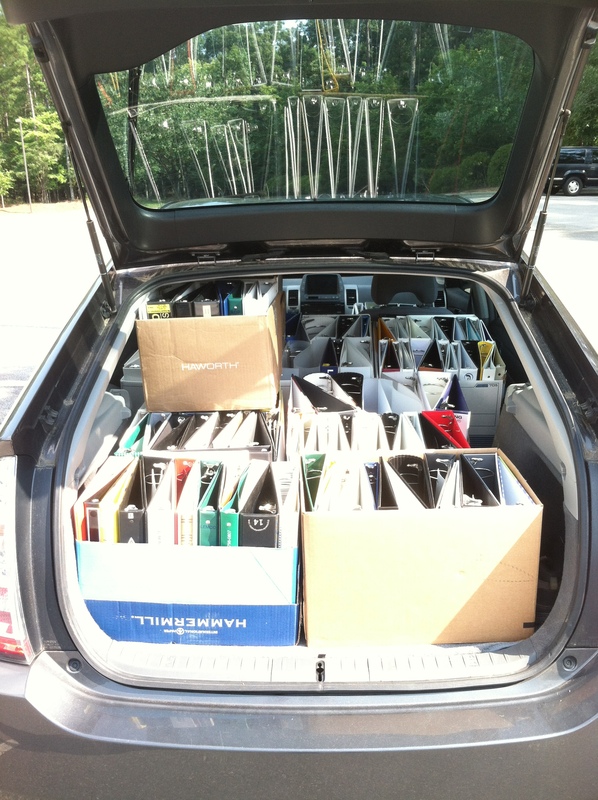 In Raleigh, an equally astounding amount of binders were painstakingly packed into the personal Prius of John Faron. Though not specifically counted, John organized not only the physical arrangement inside his car, but also the donation to nearby Orange County Schools. Raleigh has also been donating material samples to the Scrap Exchange, a local non-profit that resells the materials to local artists, teachers, and other individuals looking for oddball materials to use in their projects. Other offices have been organizing similar efforts. Tony Bell in Richmond, for example, will happily collect your binders for Chesterfield County Schools. If you have a future library clean-out looming in your calendars, contact your office’s Sustainability Coordinator to help plan out ways to give these materials a new lease on life. If binders and carpet samples could talk, they would thank you for it!